Back in May Mr McMullan rang my mum and asked would I like to play at Croke Park at half time for the men’s semi final All Ireland game. The two teams that were playing were County Mayo and County Tipperary but I didn’t know which team I would be representing. There was a bus full of people from my club Aldergrove and 16 of my family also went. I had to go with my mum and dad in the car because we needed to be there early. When we arrived in Dublin we had to go to a community centre to register and that’s when I found out I was wearing the Mayo kit and that I would be allowed to keep it. When we went into the room my uncle Christopher was there with my cousin Orleigha who was also playing for Mayo. I wore the number 5 jersey and she wore the number 6 jersey. 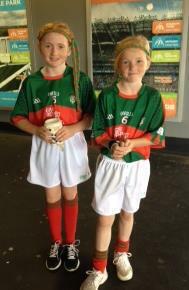 It was really special for my Granda Guinness to watch two of his granddaughters play on Croke Park. I was feeling very excited and a little nervous as there was over 53,000 people attending. Just before half time we had to go down and get ready to go onto the pitch. It was amazing! All those people in the stands watching us and our families there to support and applaud for us. My mummy was very excited. We played for around 10 minutes and I got some good touches of the ball and some good blocks. When we were coming off the pitch my mum and all my Aunts were at the bottom taking our photo and videos because she said it was a special day. I got the bus home with the Aldergrove people and it was so much fun. The men had a sing off with all the children but the children definitely won. It was a brilliant day one I will remember forever. Thank you Mr McMullan for giving me the opportunity it’s great to be able to say I played on Croke Park the home of our national sport.